This is for all levels of sewers. Whether you are a seasoned pro, or you've never touched a sewing machine, you can attend this course. Everyone will walk away with tips and techniques to improve their sewing skills or inspire them to learn and sew more! Product knowledge, sewing tips, and free patterns; all supplies (given to you in a great sewing accessory bag), projects, and catered lunches are included in your registration fee for this FABULOUS Two-Day Course. Registration fee is $199. Once you have finished "Taming That Technique" you will receive a $50 gift certificate to Sew Much Fun! 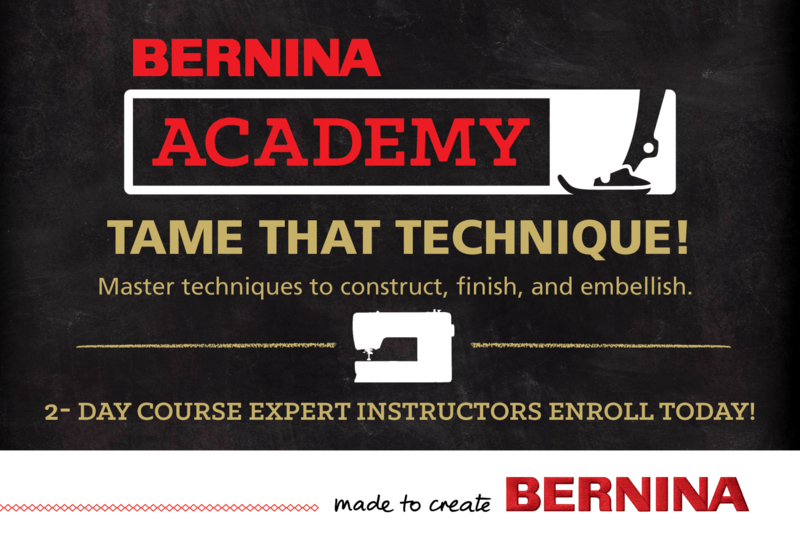 We will be sewing on the BERNINA 880 Plus, 790 Plus, and 590E. If you choose to purchase one of these fabulous machines during the Academy Event, we will deduct the registration fee from your machine purchase and the Event will be FREE! If you already own a 590E, 790 Plus, or 880 Plus, we ask that you bring your machine to our event and share with one other student.